There are many different ways to listen to HPM Classical, so we put together a few tutorials to guide you through the process. HD Radio™ is a proprietary digital broadcasting format created by Ibiquity Digital Corporation that allows for broadcasters to send multiple compressed audio streams within one over-the-air signal. To be able to receive HD Radio™ content, you will need to purchase an HD Radio™. It is also recommended that you purchase a high quality antenna. Though the transmission tower is the same as KUHF, our HD signal does not reach as far as our analog signal, due to FCC restrictions on HD Radio™ transmission power. Currently, HD broadcasts are limited to 10% of the power of their analog brethren, meaning our HD signal is broadcast at 10,000 watts, as compared to KUHF’s 100,000 watt transmission. The HD antenna is also located at 1,460 feet on the same tower, which is lower than the analog KUHF antenna. 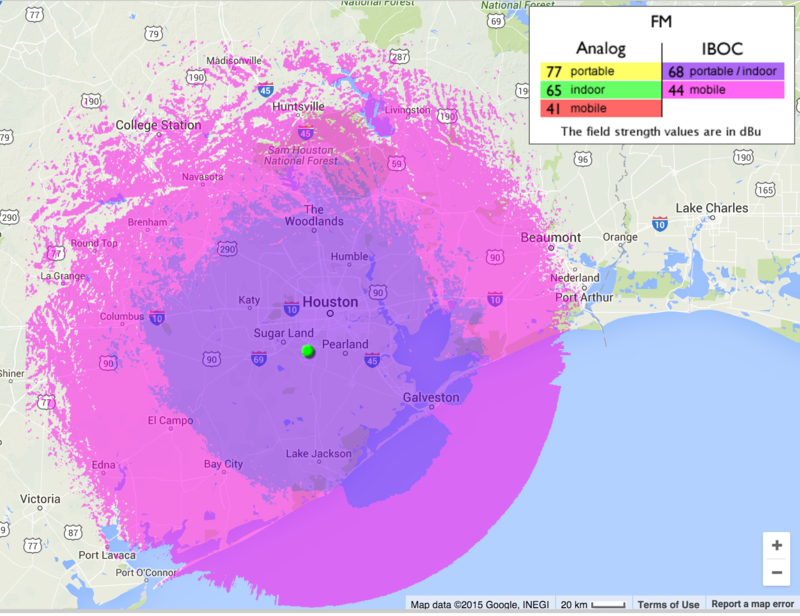 As you can see from the above map, while the area covered is fairly large, the transmission quality can drop greatly the further from the transmitter you are. Unlike analog transmissions, digital broadcasts suffer from a phenomenon called the “Cliff Effect.” Analog signals gradually degrade over distance, as signal strength decreases and more electromagnetic interference is introduced. Digital signals represent data that is transferred in either a perfect, complete state or not at all. 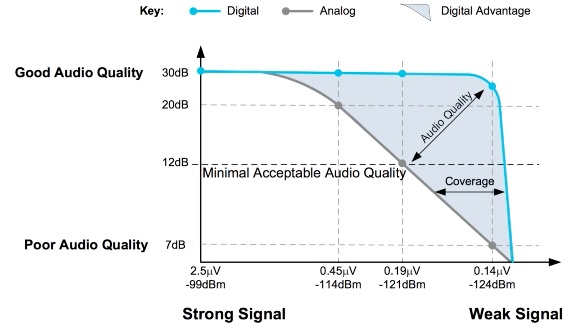 That’s why you can receive HD Radio™ signals at roughly the same strength and quality to a point, and then not at all. Our streams are also available through several outside services that you can listen to using your browser. All of our available streams have been compiled into one playlist file that can be opened in your media player, or you can choose which stream is best for you. AAC (short for Advanced Audio Codec) is an audio encoding format that provides a very high quality-to-bandwidth ratio, meaning you can receive a higher quality stream on a slower internet connection. However, due to licensing and patent issues, not every player supports AAC. MP3 is an audio encoding format derived from the MPEG-1 video format. As it is an older specification, it can’t deliver the quality-to-bandwidth ratio that AAC can. However, it makes up for it by having near ubiquitous support across media players. If you are experiencing intermittent interruptions in our streaming, there are a few things that you can check. If you’re connected to Wifi, check your connection strength and try moving closer to your router. If you live in an apartment or similar area and are connected to Wifi, you may need to check your router’s configuration. Most modern Wifi routers broadcast in the 2.4GHz range by default. This provides a good mix of range and bandwidth, but within a densely populated area like an apartment building, this slice of electromagnetic spectrum can become saturated, which can greatly decrease the strength of your connection. Newer Wireless N and Wireless AC routers can also broadcast in the 5GHz range, which may be helpful to use if available. The 5GHz signal doesn’t provide as great of range as the 2.4GHz signal and can’t penetrate walls or other objects as easily, but is usually less crowded. If you’re on Wifi, try moving closer to your router and see if your connection improves. You may also try power cycling your router and modem. Simply unplug the power cable, count to 10, plug it back in, and wait for your devices to reconnect. If that still doesn’t work, you may want to run an speed test to verify your connection speed. SpeedTest.net is a good option, or you can simply search for “speed test” in your search engine of choice. Audio streaming doesn’t take a large amount of bandwidth (less than 1Mbps), but if your connection isn’t able to sustain that, you may want to contact your ISP for help. We offer our streams over a secure connection, but some players and devices are not compatible with that type of connection. If you’re having troubles, you can also try accessing our streams over a non-secure connection (listed above). If you cannot access our streams at all, and are trying to connect to us using an office or corporate network, then your company’s IT department may be blocking streaming altogether. In order to save bandwidth and ensure quality-of-service for their users, many companies block video and audio streaming on their networks. We don’t necessarily enjoy that practice, but we certainly understand and apologize for any inconvenience. If none of these options work for you, contact us and we will help. Classical’s streams are also available in a number of other streaming apps.